The 21823-L is a common accessory for the CPEC Closed-Path Eddy-Covariance Systems. 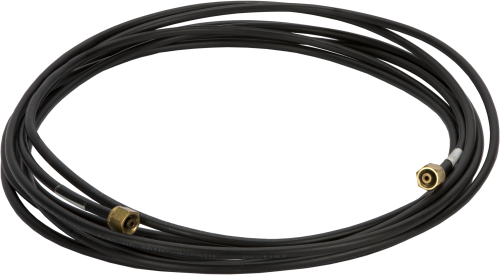 The 21823 provides a calibration gas tubing assembly. Tubing length is user specified. The tubing assembly is for the zero calibration, CO2 span, and H2O span, so each system typically needs three of these. The tubing for the H2O span requires a Tee Connection (option -TT). Can Campbell Scientific assemble the fittings onto the tubes? It is easy to learn how to cut tubing to length and swage the fittings. However, if it is preferred, order tubing assemblies cut to a specified length using pn 21823-L, Calibration Gas Tubing Assembly. Why are inserts recommended for the tubing? The inserts prevent the tubing from collapsing as the ferrules are swaged onto the tubing. Although it is possible to make a leak-tight connection without an insert, the insert provides added protection against leaks. This is particularly true for tubes at negative pressure and for repeated tubing disconnect/connect cycles. How are Swagelok tubing connections made? Refer to the Swagelok appendix in the AP200 or CPEC200 instruction manual. Why will the tubing not go into the ¼ in. fitting on a regulator? Make sure the fitting is a ¼ in. Swagelok. It is possible that it is 6 mm instead. Metric fittings can be identified by the groove on the hex body of the fitting. If the fitting is 6 mm, replace the fitting on the regulator with a ¼ in. Swagelok, or use an adapter fitting.